It was only a matter of time before this picture happened. Wonderful!!! I like it so classy and modern in the same time. Excellent capture. Luck is often a factor for a good capture. Your framing and focusing is great too though. love that you catch that moment! Hahaha! Not quite as elegant as a bicycle but I guess this is about as fabulous as it gets on a segway. I'll go with Geek-chic. Not sure whether it's quite as classy as a bike, but at least it's fun. And I do like the way his hat is flicking up slightly in the wind! It's a classy-looking Segway, too. That's probably the highlight. he is totally on point with the red trend! haha! great capture. That is so funny. I thought it was Anthony Hopkins and then I scrolled down and saw the wheelie thing. Although it is similar to the thing they wheel him out on on Silence of the Lambs. Haha! It just made me laugh. Great snapshot! Excellent pic! There's always been a latent streak of infantilism in Italian men and technology is helping to bring it right up to the surface. 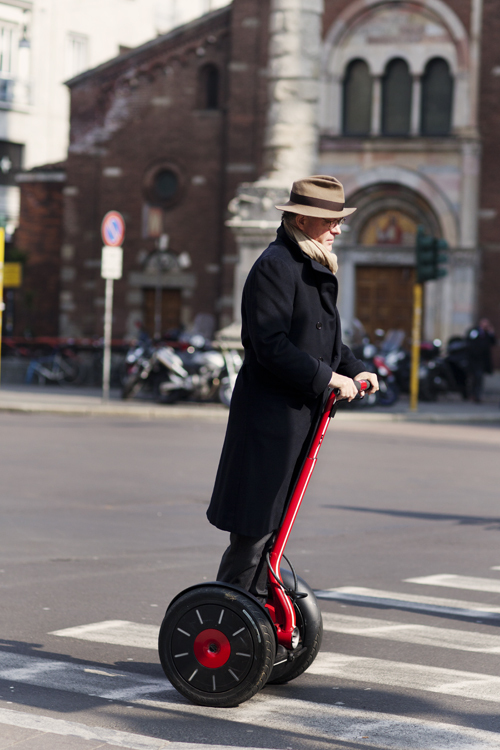 The juxtaposition of the modern segway and the classic hat, scarf, overcoat combo is beautiful. Perfect blending of new and old… even the backdrop plays a part, the old church mixed with the stop light and motorcycles. Incredible. HAHAHA! Where is this guy going? So cool and so funny at the time ! This is great! About 6 years ago when I was in Rome, I saw a few of these, and they weren't tourists so I guess Italians have been ahead of the curve. I love the red. just wait until heels will be out and segways will be in! Nice picture and indeed 'a matter of time', hehe! But man, you don't want to be seen on such a dull vehicle, come on!! Such class. Italians are incredibly sophiscated. Form and function. The gadget is almost an accessory to his look. hahah omg i love it!! Ferrari Red. I wouldn't have it any other way. Love the picture, Sart! Blasphemy! Get that man a Vespa. what an incredible photograph. well done mr. I love it! I kind of giggled a bit at this photo due to noticing how technology is truly revolutionizing the world. Now fashionable people such as this man will be cruising around the streets in segways. Even this finely dressed gentleman falls prey to the undeniable truth: nobody looks cool on a segway. cool photo, but at first i thought this was you?! is it? hmmm, i guess not, after reading the comments above. not cool. terrible. (not your photo may i add) plus hes going to be 50st heavier in about 2 years thanks to that segway, hes not going to look so sartorially elegant then. Wow this looks like fun!!! Really cool. Love how u captured the moment. Hope you can check out my blog when u get a chance. I would love to have your opinion on my page. Lucky you to picture it. Kind of defeats the purpose, in my opinion. Hard to look like anything but silly on one of those things. This is truly a milestone for me…and for all of humankind…On this day, February 24 2011, I see before me a well dressed man on a segway. I shall tell my grandchildren of this day and the man who took this photo! I too thought that was Anthony Hopkins! I hate segways but think this man is actually much cooler and infinitely better dressed than your average segway rider….so I love it! I have so much love for this picture. His attire is fantastic, and really showing the future of how modern men will getting around! The inherent funniness of a person on a Segway is directly proportionate to the seriousness of said person. Clown on a Segway? Not that funny. Grumpy Michael Arrington on a Segway? Very funny. This kind of falls somewhere in between. This is the best dressed segway rider I have ever seen. As it is in Italy, will Segway cut into Vespa and its similar bikes? I don't know about this "classy" business. However, this contraption does look a less ridiculous than the ones mall security officers use in the States. In this, yes, I'll concede to "modern". Oh god the satorialist! you are so cool! I never comment cause a million ppl already do and they all say the same thing anyway but I had to say somethin to this one. You are the jam! In Italy, even segways look enchanting. Hahaha, that's pretty awesome. You need to be shooting street style on one. How amusing. It's not just Ferrari red, it's actually a Ferrari limited edition Segway. Great picture. Now that looks like fun. I've seen a couple of those here in NYC. I don't know how well they work in busy streets though. These things are hilarious. They remind me of my months in Firenze. Although, that is certainly the most stylish person I have seen frequent such machines! I wanna try that thing! it looks so exciting! Many years ago, a time that many of us are old enough to remember, pictures of what the future was to be like were all over the place from world of tomorrow magazines to television science programs like Here Come The Seventies and Omnibus… Events like Montreal's Expo67, world fairs and countless science and technology museums showed models and prototypes of what the future might hold. Moving sidewalks and flying cars and the like…This image vividly brings back all of those times visiting the many different places and events with wonder in the eyes and imagination whirling with fantasy(sic). As much as these have been maligned at times the image is very much, 'the future is now'. Thanks Scott for re-igniting a little bit of nostalgic imagination and the freshness of childhood too often lost in the all too easily jaded world of adulthood. Thank you for bringing back that sensation of wonder and imagination in this all grow'd up child's eyes of so many yester-years and days gone by! Oh gosh I love it. Chic on a Segway. They are such a strange way to get around. honestly is this like riding a bike?.. what if you fall forward on your face..
im guessing this would require balance to. looks so fun! I love how its red! Such a small world! I was watching Iron Man this afternoon and one of the characters used that bike, except it was black and seemed to be used for long but short distances, if that makes any sense!! I feel its just a bit different from the norm, probably why so many of the viewers can't see it as classy, its new, take a while to get used to, but heyy, let's hope fashion will quickly embrace this new tech! love the picture, super rad stat! But of course not just the standard model. A sartorial version of…. Love it! It just wouldn't have the same feel if it were set in NYC. Definitely the best dressed man I've ever seen on a segway. I always laugh at people on segways – it just reminds me of Arrested Development! This is the future Issac Asimov envisioned for us all in 1939. While I have mixed emotions about Segueways in general, leave it to a gentleman in Milan to ride the most stylish, red Segueway I have ever seen. the Segway, well its red, but meh. Now the hat, i want the hat! The worst accessory! I hate them! I snorted with laughter when I saw this picture. Regardless of how useful the device is, I will always associated it with Gob from "Arrested Development". Here in San Francisco, when the weather is nice you can sometimes spot whole tour groups of people, wearing bike helmets and fanny packs, buzzing about on their Segways. Darting through parks, and maneuvering traffic in perfect, unspoken unison– like a school of fish. This is glorious…a bit of science, meets a bit of design and a bit of culture. Well, at least it's red. These vehicles make you look like a fool. No matter what you wear. Happy weekend to you and Garance. Hahaha he's like "Get outta my way you squares!" I just can't take these things seriously, sorry. They're definitely not cool. This is neither eccentric nor trendy. It's plain ridiculous!!! I love his hat in the wind and the whole look + vehicule seems to belong to a book of Tintin. Ahahaha wow I love hte irony of this pic…cool! jajaja this made me crack up. But look at this stunning hat! And although same vehicle, he looks nothing like a mall cop. I want one! (The man's nice looking, too). Walking on cement can RUIN your shoes! This put a big smile on my face. You are right, it was just a matter of time. Ha! This just cracks me up! Great shot. Paul Blart goes to Milan? Clearly the man is confused. I'd recommend a yellow jump suit. How the hell can you climb stairs or even sidewalks with that? I like that he looks so deep in thought while speedily zipping away..
what an amazing shot! you were simply in the right place at the right time:)) awesome one! Hmmm… What'll happen if the hat flies off? I like it so much..Maybe in few time we'll see it really in milan! He must be the only person who can make a segway look cool and chic. Impressed. Reminds me of something I saw in New York a couple of years ago – a similarly elegant older gentlemean on a segway on the Upper East Side. A bizarre sight amongst all the traffic! an LOL is all i can manage. This made me giggle. He is oh so serious. If you dare tell him that he is not fashionable and hip and on the cutting edge of EVERYTHING, you would certainly get a mouthful. Love it. this looks like a graphic illustration. very cool. I was there when this man zooted past.. it was surreal! anything goes in Milan. Sign of the times – a true Gent! Wow! The Segway is seen on Detroit’s spectacular new waterfront promenade called the Riverwalk; awesome machine. Great photo. This is really humorous. I can hear the William Tell Overture playing in the background.